A Bay of Naples sailing itinerary takes you to the stunningly beautiful Phlegraean and Pontine islands stretching westward into the Tyrrhenian Sea from the Gulf of Naples, and to the picturesque harbors of the Amalfi coast on the Sorrento Peninsula just south of Naples in the region of Campania (see Bay of Naples maps). 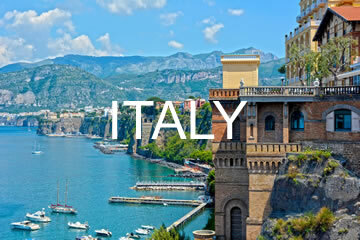 Both cruising grounds are enchanting and blend the bustle of chic ports of call such as the Isle of Capri with the quiet ambience of small Amalfi fishing villages such as Cetara. Swimming and sunbathing on pristine beaches, sightseeing tours of castles, fascinating archaeological sites, and historic island and coastal towns, browsing in eclectic boutiques where fashion is of the first order, and dining in fine restaurants serving exquisitely prepared local cuisine are among the many pleasures of sailing in these waters known for gentle winds and splendid anchorages. Procida Island to Ischia Island - 3 nm. Your Bay of Naples itinerary typically began the previous day, Saturday afternoon at 3:00 P.M., when you arrived at the base to check in, provision the boat (if you hadn't elected to have us do it for you), and receive your pre-cruise chart briefing. Now that you've had a restful night aboard, it's time to head out onto the shimmering Tyrrhenian Sea to your first port of call, the beautiful and fascinating nearby island of Ischia, the largest of the three islands in the Phlegraean group. It's a short passage to the southwest, allowing plenty of time to fully explore ashore. A special treat is a visit to the thermal gardens, which have pampered the rich and famous for centuries in the comforting hot springs said to have healing properties. Mooring: Moorings are available at Lacco Ameno and there is also a marina. Porto d'Ischia is the main harbor on the island, followed by Casamicciola and Forio. The small port of Saint' Angelo is highly recommended; it gets crowded on weekends. A particularly beautiful beach lies on the north side of the island at the bay of Cala di San Montano. You can also anchor off the north and south sides of Castello d'Ischia, with marvelous views of the impressive castle. Things to do: Ischia is an extinct volcano and like other islands in its vicinity jagged rock faces, sheer cliffs with white surf at the bases, beautiful beaches, and low mountains give it beauty of a breathtaking character. As you approach from the sea, the heights of Monte Epomeo soar skyward 2,582 feet. It has a promenade where you can admire the views, then dine at one of the excellent restaurants. Thermal therapies, mud baths, facial treatments, and other spa delights are a major attraction. Negombo in Lacco Ameno and the Poseidon Garden in Forio are among the most famous thermal gardens on the island. Sightseeing tours of the historic buildings is another fascinating pursuit. Visiting Castello d'Ischia, an Aragonese castle built in 1438, will give you an overview of Ischia history. Located on a small island at Ischia Point, you can climb more than 300 feet to witness the splendid views. The Farmer's Museum, Museum of the Sea (other islands have sea museums, too, which isn't surprising), and the Archaeological Museum of Pithecusae are all worth visiting. Maronti Beach yachting is particularly pleasant. The beach is a great place to enjoy lunch. Facilities: Dockage is available. Porto d'Ischia, Casamicciola, and Lacco Ameno have fuel and water. Forio and Saint' Angelo have water. Provisions are available. Ischia Island to Ventotene Island - 20 nm. Your course from Ischia takes you nearly due west past tiny Santo Stefano island, a wonderful day anchorage for going ashore in the dinghy to explore, swim, and enjoy a leisurely lunch on your first day in the Pontine Islands. Beyond is Ventotene and its many interesting attractions, including a museum, shops, and restaurants. You can either anchor in a secluded bay or arrange for dockage in the main harbor. Mooring: No moorings are available. The best anchorage is in picturesque Porto Ramano. Cala Parata and Punta Pascone on the west side of the island are also scenic anchorages. Things to do: Fine beaches for swimming and sunbathing, quiet streets filled with pleasant shops and some restaurants at Cala Rossano and Cala Nave, and the Museum of the Sea are the main attractions. Cala Parata and Punta Pascone are beautiful bays on the west side of the island. They are simply marvelous places to spend time at anchor and to explore ashore or in the dinghy. Nearby Santo Stefano is a fun day anchorage (its on the north side of the island) for a leisurely lunch aboard and a sojourn ashore to climb the hills and to visit the ruins of a Borbon prison. Facilities: Fuel and water are available at Ventotene Cala Rossano. Water is available at Ventotene Porto Vecchio. Ventotene Island to Ponza Island - 20 nm. A northwesterly heading takes you farther out into the magnificently blue Tyrrhenian Sea. All around you high islands dot the horizon, some appearing almost purple in the distance, others black, tan, and green from the conglomeration of volcanic rock and the forests and lush Mediterranean vegetation covering the steep slopes. The sail is long enough to give you a real feel for the open waters between islands as you raise Ponza off the bow. This island is interesting for its relative isolation, its quiet streets, its gorgeous beaches, and its network of ocean caves that can be explored in the dinghy. You can also enjoy a barbecue on the beach, as you admire your yacht swinging gently at anchor. Mooring: No moorings are available. There are numerous anchorages at Ponza. Your choice depends on the wind direction at the time of your visit and whether you want a quiet beach or you want to be in Porto di Ponza to enjoy its shops and restaurants. The bay of Cala Chiaia di Luna has a beautiful beach. It is highly recommended. Other scenic anchorages lie between Punta Santa Maria and Cala Inferno and between Punta Frontone and Cala d'Inferno. Things to do: The many ocean caves that penetrate the rocky shore are one of the most intriguing geological formations on Ponza. You can explore them by dinghy or snorkeling excursion. The ones between Cala Chiaia di Luna and Cala dell' Aqua are fascinating. A tunnel excavated in Roman times connects the beach at Cala Chiaia di Luna to the nearby town. Swimming and sunbathing is ideal between Cala di Feola and Cala dell' Aqua, and between Faraglioni and Capo Bosco. Aside from a foray ashore to browse the shops of Porto di Ponza or dine at one of the restaurants, another interesting sightseeing venue is at the north end of the island, Arco Naturale, a phenomenal natural stone arch. Open-roofed taxicabs and minibus tours of the island are available. They don't take long because the island so small! Overall, cruising in Ponza is an experience to savor. Facilities: Fuel and water are available at Porto di Ponza. Ponza Island to Palmarola Island - 5 nm. Still heading northwest, you'll soon reach the mostly uninhabited Palmarola Island, the westernmost of the Pontine group. Sailing around it rewards the eye with views of the craggy heights and picturesque bays. Much of the island is in a natural state, as if time forgot it was there and development passed it by. The beaches are beautiful and unspoiled, the swimming and sunbathing ideal. Exploring ashore is a pleasant way to spend an afternoon. Mooring: No moorings are available. 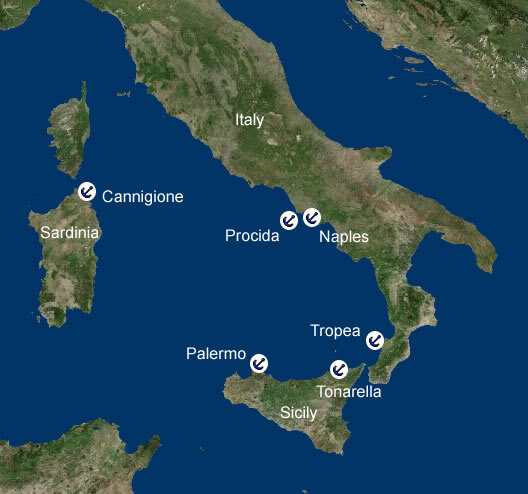 There are several excellent places to anchor in settled weather, but if conditions are likely to deteriorate, the short sail back to Ponza for overnight anchoring is advised. As always, the choice of your anchorage is subject to wind direction. The main port is Cala del Porto. Other anchorages include the area between Faraglione di Mezzogiorno and east of Scoglie di Suvace. Things to do: The main attraction of this island is its natural beauty, swimming and sunbathing on pristine, isolated beaches, and exploring the caves and grottos. A great place to stop for a few hours is Punta Tramontana, on the north side of the island. There are two small restaurants at Cala del Porto that specialize in seafood dishes. Palmarola Island to Capri Island - 64 nm. Now that you've sailed as far west as you can in the Pontine Islands, it's time to turn eastward to experience the unique and distinctly high-end pleasures of the Isle of Capri, long a haven for the chic and sophisticated of Europe who routinely vacation there. Get an early start to arrive early enough to go ashore at Capri Town and stroll the narrow streets off Piazza Umberto, the public square. Dining out in style is an option; upscale restaurants abound. Mooring: Moorings are available in the harbor of Capri, though this is a busy and expensive location. It is difficult to find a berth. There are few places to anchor at Capri because of the deep water. The best anchorage is at Marina Piccola on the south side of the island. Things to do: Sightseeing on Capri includes many attractions. Built about 700 years ago by Count Giacomo Arcucci, an advisor to the Queen of Naples, the Charterhouse of San Giacomo is a fascinating complex with a museum highlighting some of Capri's history. Dating back even further is the Villa Jovis, built by the Roman Emperor Tiberius in 30 A.D. atop Monte Tiberio. Like modern-day vacationers, Tiberius evidently loved Capri; he built eleven other villas on the island. An interesting hike takes you to the Phoenician Steps (Scala Fenicia), a steep path leading between Capri Town and the island's other settlement, Anacapri. It has more than 500 steps and ascends more than 800 feet, providing superlative views of the island. The Blue Grotto is another wonderful attraction of Capri yachting. An ocean cave eroded into the northwestern shore, it's big enough to take a boat (or dinghy) inside. Sunlight shimmers in the sea, coloring it in myriad shades ranging from azure to sapphire. Facilities: Fuel and water are available at Marina Grande. Provisions are available. Capri Island to Procida - 20 nm. 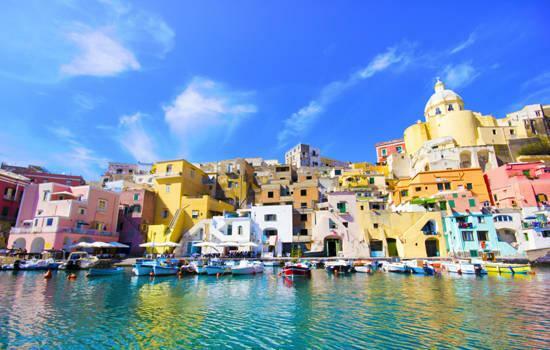 Your last full day of sailing takes you northward to Procida. The islands line the horizon to the west and to the east the beautiful Amalfi coast on the Sorrento Peninsula looms unbroken. Some sailors work a day or two of Amalfi cruising into their Phlegraean and Pontine itineraries, backtracking from Palmarola Island earlier to make time to visit the beautiful and quaint fishing port of Cetara, the bays and beaches of Palinuro, or other destinations. Either way, as you arrive back at the base by 5:00 P.M. to check out the boat, you'll bask in the sheer delights of the past week on the Tyrrhenian Sea. Mooring: No moorings are available. While it's possible to anchor off Procida, most sailors tie up at the marina. Things to do: Procida is only 2.4 square miles in area, and yet it is the most densely populated of the islands lying offshore of Naples. Long a favored fishing port, the tradition of fishing that began with the Greeks and Romans lives on in the seaside village of Corricella, where you can walk along the waterfront and admire the utilitarian beauty all around you as the fishermen mend nets on the wharves and a balmy breeze ushers in the tang of the fabled Tyrrhenian Sea. Of particular interest is Terra Murata (meaning walled up land). It was the first settlement on Procida built at the highest point on the island at 298 feet above sea level to provide the best defense against Saracen raiders. A stroll to the settlement will reward you with marvelous views of the surrounding waters. Several of the popular beaches include Chiaia, Chiaiolella, and Pozzo Vecchio.